The mobile gaming industry is one that has been rising in popularity with the consistent releases of newer and more powerful mobile gaming platforms, like Apple and Android devices. Bethesda’s Fallout Shelter is one of the most popular gaming applications for mobile devices and today, an enticing new update was released. Included in this update is the ability to own pets, among other features, of course. For those of you who haven't yet played Fallout Shelter, the sole purpose of the game is to construct and maintain your Vault from the radioactive debris and fallout resulting from the Great War. It’s your job as the Overseer to protect the vault from any and all undesirable radroaches, raiders, and countless other threats. Manage that and you’ll want to start focusing on expanding the Vault, which requires an abundance of resources. You’ll be constructing Living Quarters for the Vault dwellers to sleep, Cafeterias to produce the food and water, and Power Plants to keep everything operating at full capacity. Needless to say, it’ll be a time consuming endeavor. The free update for Fallout Shelter most notably contains 4-legged companions which includes our furry friend Dogmeat and with his presence, there will be a significant impact on your Vault’s happiness and productivity. 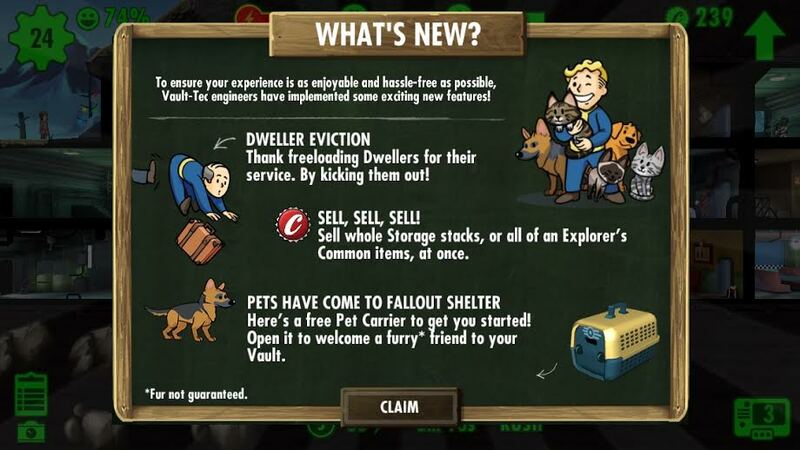 Also new to this update is the ability to evict unwanted vault dwellers for whatever reason, as well as a Sell All option to help those with an abundance of items to sell. Let’s not forget about the new ways we can impress other Vault dwellers as both male and females have been given some new pickup lines and conversations. In addition to all that, several improvements and optimizations have been made to keep the game running at its best. This new update is now available on Android and Apple devices.